My Christmas wish is to have a hearty meal with my family - my parents, siblings, hubby and children. But in terms of logistic, it is challenging to bring the whole village family out to dine at a restaurant. Preparing a meal for the whole family is even more challenging for me! The kind folks from The King Louis Grill & Bar granted my wish - they sent their Festive Dining Take Home Set right at my doorsteps! The packaging looked really like a Christmas present! All these are the must-have to celebrate Christmas! The feast is meant for 5 pax, but it was sufficient for 7 of us - 5 adults + 2 children! The children loved The Castle BBQ Wings. By the time I sat down to start eating, there was only one drumlet left! Soft banana wrapped by crispy bacon, Banana Bacon Bite gave my mum a pleasant surprise. Premium BBQ Baby Back Ribs were well-marinated and tender, no wonder they were our favourite. Roasted Queen Pullet was succulent, it was amazing that the juice was well retained after roasting. I seldom eat lamb steak because I don't really like its gamey taste. However, Lamb Steak with Rosemary Herbs from this set did not have such strong flavour, and I ate two pieces! 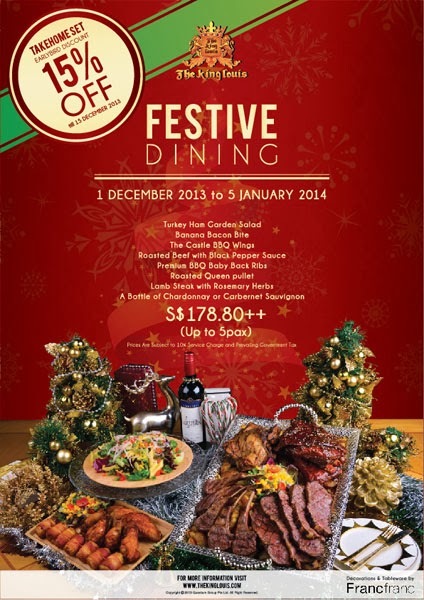 From now until 5 January 2014, you can order this Festive Dining Take Home Set by either completing the order form on their website or calling them at (+65) 62760862. The set costs S$178.80++, there is early bird discount of 15% until 15 December 2013! The giveaway will be closed on 14 December 2013, 2359hrs. One winner will be randomly drawn. The winner will be announced and notified on 15 December 2013. Congratulations to the winner - Daphne! Disclaimer: We received a complimentary Festive Dining Take Home Set for review purpose. No monetary compensation was received. All opinions, photos and taste buds are mine. Will be having the meals with family namely parents, siblings, & my children (3 generation in total). Hope to win this. The feast looks wonderful. It must be a great boon to have this delivered while you're busy doing other things. Francene, it was really convenient to have the feast delivered at my door steps! Thanks Windy. It was an enjoyable dinner with my family! Sophie. my friends from US and Hong Kong comment that things in Singapore are more pricey! Oooh the food looks really good!! If I win the vouchers, I'll definitely be bringing my husband and daughter plus her godparents.